I did something on Saturday I rarely do: I chose to watch a horror movie (in the theater, no less). 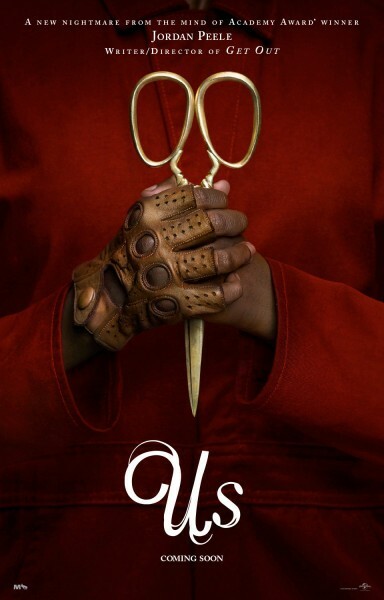 After watching Get Out at home a year or so ago and regretting not seeing it in the theater, I promised myself I’d see the next Jordan Peele movie with a live audience. There’s something fun about being scared in a crowd, especially an interactive crowd. In those regards, I had fun watching Us. There were a few moments where people cheered or shouted at characters making unnerving choices. And while it was a movie that rarely resorted to the cheap thrill of jump scares, there was plenty of tension. However, despite everything in the movie being done well–the acting, the direction, cinematography, editing, dialogue, etc–I found the overall result a bit boring. It reminded me of a Kubrick film in a number of ways, including the pacing. (MINOR SPOILERS) The movie features two “twists”; one is more of a reveal than a twist, but I liked that it conveyed a bigger movie than what was advertised. The final twist fell completely flat for me, as I like twists that make you see the entire movie in a new light, and that wasn’t the case here. But I’m glad Peele made the film. It’s clear that he had a specific vision for it, and I’m glad to see an original movie do well. What did you think about it? This entry was posted on Sunday, March 24th, 2019 at 10:32 pm	and is filed under movies and tagged with movies. You can follow any responses to this entry through the RSS 2.0 feed.